Just a guess: The words “Hold my beer” were spoken moments before this ice fishing video begins. The video shows a guy who's a cross between James Bond and James Belushi. As you’ll see, the angler is using a set line with an apparatus designed to set the hook after a strike. It’s sort of like a tip-up, but it enables an angler to fight a fish on rod and reel instead of hand-over-hand. It’s a clever system — assuming an angler is close enough to mind the store. While much of the Midwest and North is now blanketed in a lot of snow, this winter began with cold temps and little snow. This meant solid, thick ice, so even though breaking through wasn’t a problem, safe traction on glare ice was another story. Just ask viral video guy. For several weeks this ice season, I relied on Yaktrak Diamond Grip cleats to avoid disaster. They slip on easily over pac boots and allow you to walk normally on glare ice. Buying tip: I wear a size 10 shoe, and on thinner pac boots such as Sorels, a size XL Diamond Grip fits well. When I wear more bulky boots such as LaCrosse Icemans, then size XXL is better. 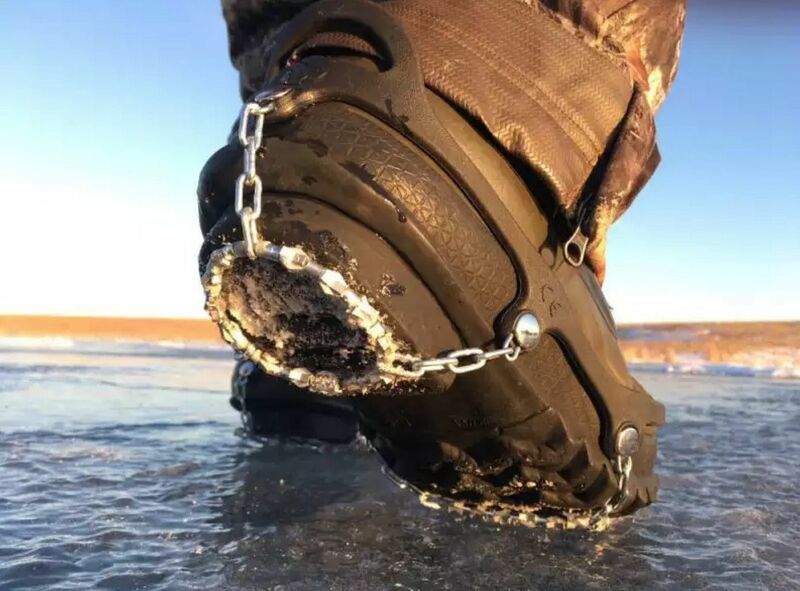 Good luck ice fishing, and be safe out there! XXL Yaktrak Diamond Grip cleats on the author’s size 10 LaCrosse Iceman pac boots.